When I told a friend recently I was heading to the far-eastern edge of the Czech Republic to visit Ostrava, she suggested I make a side trip to the Czech-Silesian mining town of Havířov, about 12 miles (20 km) east of there. I'd scarcely heard of the place. When I asked her why, she said something like "check out the train station before they knock it down." I guess she knows my taste in architecture pretty well. 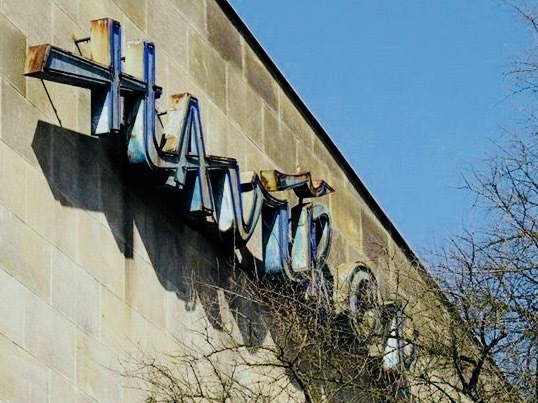 It's an amazing piece of retro-futurism in the style that Czechs call "Brussels," after the 'Brussels '58 World's Fair' -- and barely hanging on by a thread. 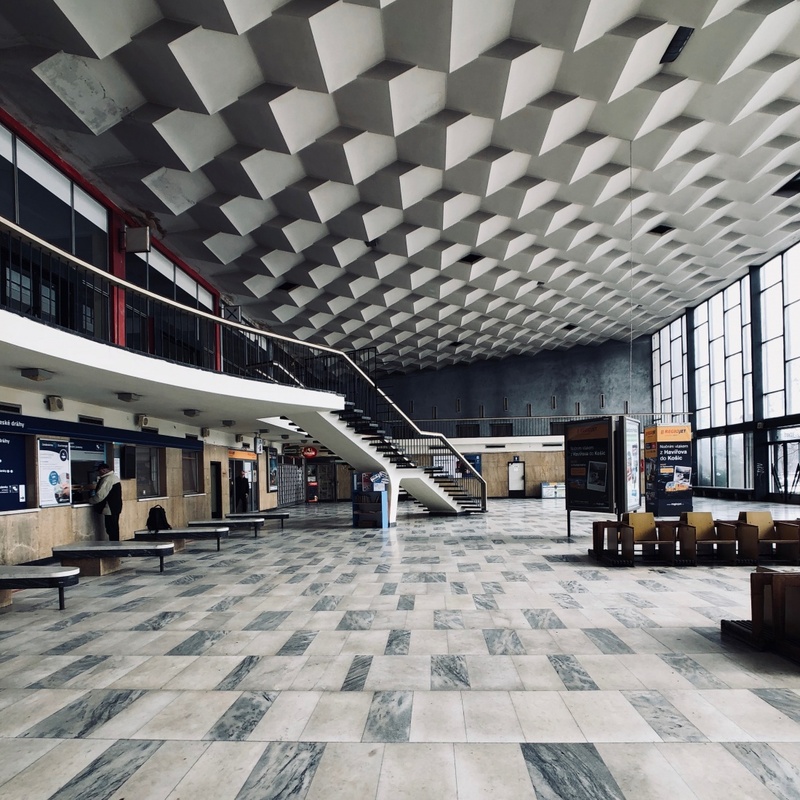 Top Photo: The small Czech-Silesian mining city of Havířov seems the most unlikely of places to have such a retro-futuristic train station, and indeed, until recently, the station was fighting for its life. Photo by Mark Baker. 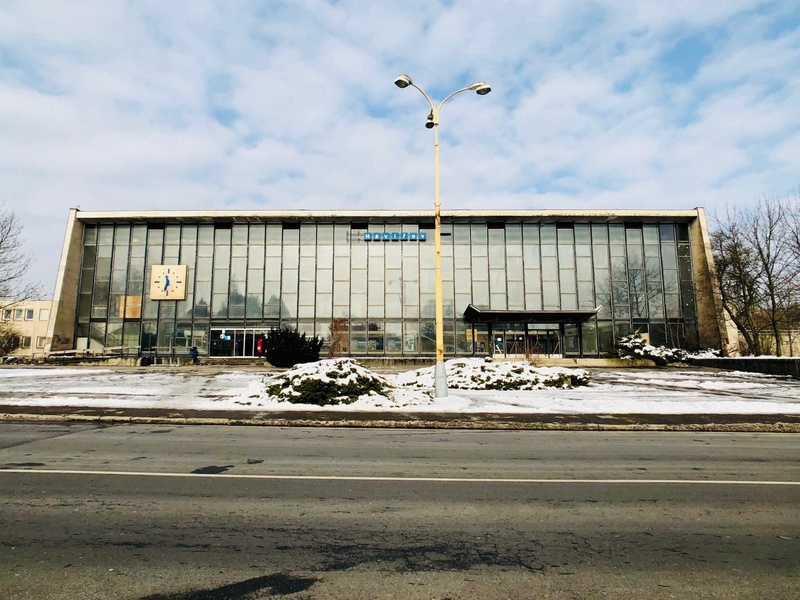 Posted in Diversions, On The Road and tagged 1960s, Architecture, Brussels, Czechia, Havirov, modern, Moravia, retro, retro-futurism, Silesia. A small, isolated island of chairs serve to accentuate the space of the main lobby. The chairs themselves have the high style of 1920s Functionalism. Photo by Mark Baker. The front exterior of the station shows the glass panels and a playfully oversized clock on the left side. Photo by Mark Baker. Curvy, marble benches line the row just in front of the ticket counters. Photo by Mark Baker. First, the good news: I don’t think they’re going to knock it down. Once I rode out to Havířov station from Ostrava (just 20 minutes away) and took a look around, I immediately panicked. 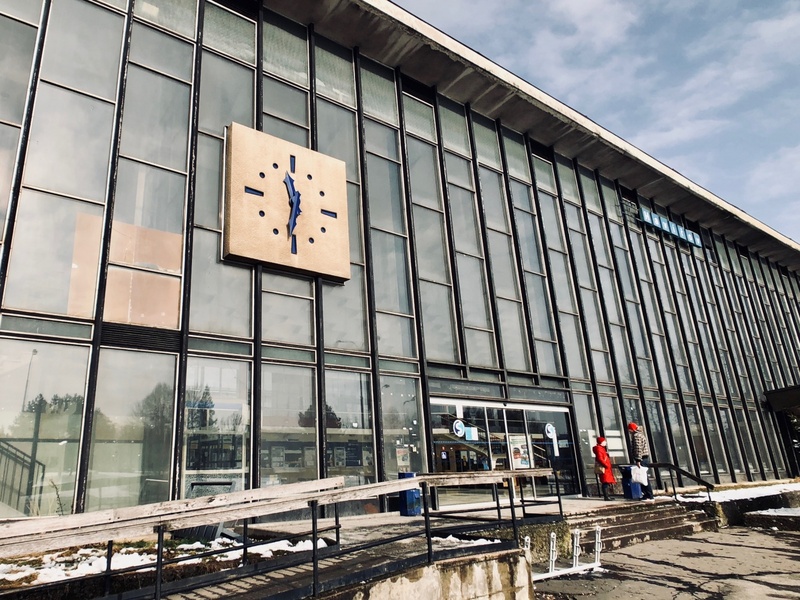 The building was obviously suffering from long-term neglect (I mean more so than the average Czech train station – which says something), and way over-scale for a relatively small train junction like Havířov. In other words, exactly the kind of building that people love to tear down. But a few minutes of googling around revealed a Herculean effort underway to save the building that I had not been aware of. 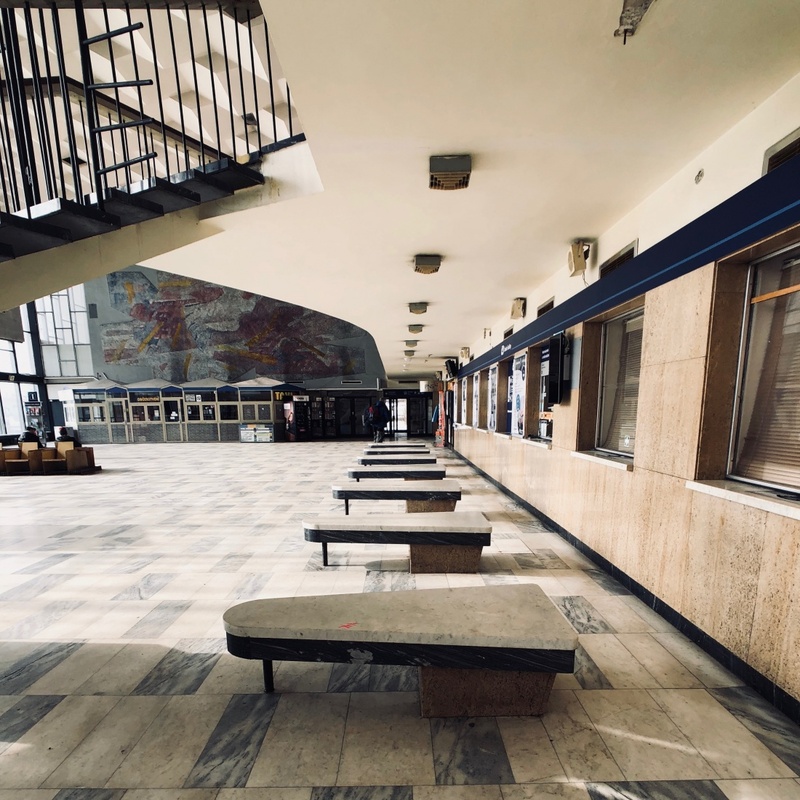 I found the website: Nádraží Havířov žije (Havířov station lives), by the local architecture association Důl architektury, dedicated to educating the public on the building’s aesthetic value. That led me down a virtual rabbit hole of exhibitions, cultural events, Facebook pages, and architectural competitions -- all focused on saving the station. The campaign eventually won over then-Transportation Minister Zdeněk Žák. In a country that sometimes seems determined to obliterate all vestiges of its recent past under Communism, it was heartwarming. The rescue effort appears to have paid off. 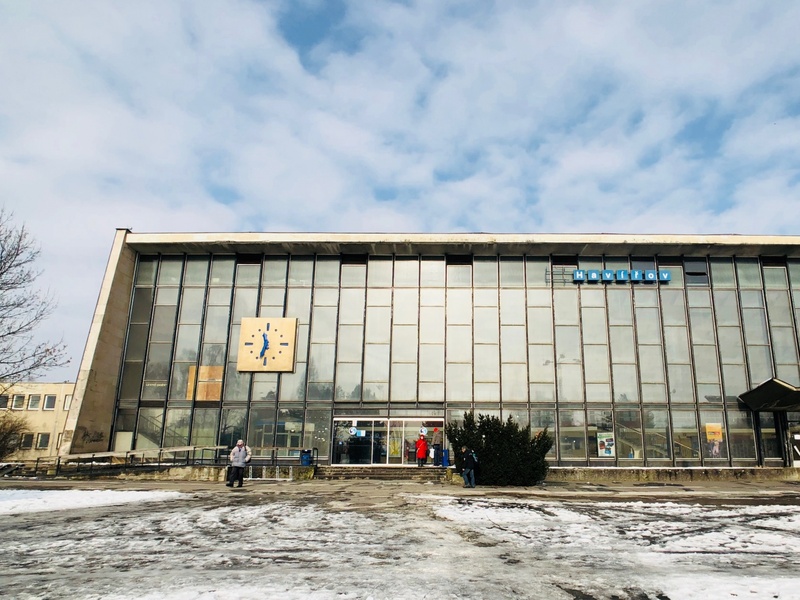 According to this news article from early February, Czech Railways (the building’s main owner) and the city of Havířov have now agreed on a project to renovate the station and rework it into a kind of transportation and community center. The architects are expected to present their design by late April, and work is scheduled to begin in the autumn. Of course, nothing is ever a done deal, but it looks now as if the main hall and the building's most important architectural elements will be preserved. Sweeping view of the main vestibule, showing the contrast between the geometric ceiling and floor tiles. The gently curving staircase softens the patterns. Photo by Mark Baker. 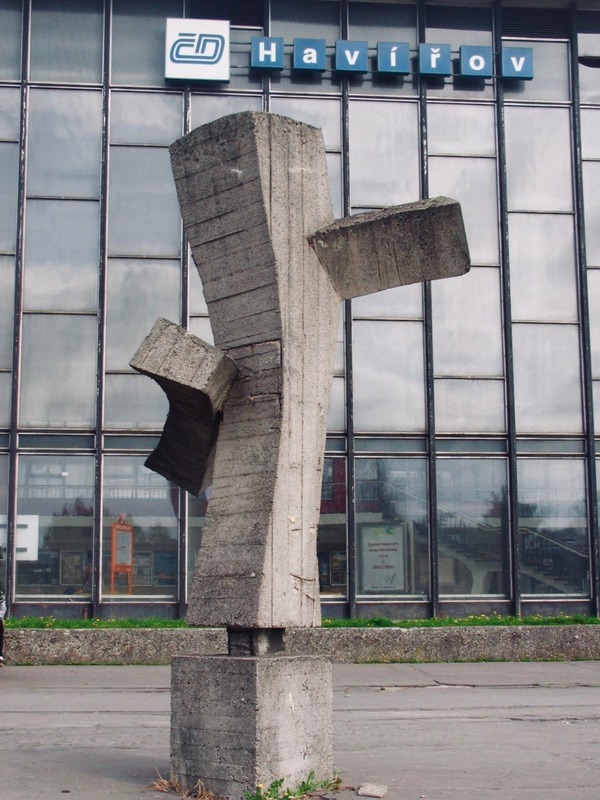 The front of the station was once dominated by a brutalist statue from 1969, which was removed only in 2014 (see the photo below). Photo by Mark Baker. An arching fly-out over the front entrance gives the building a cartoonish, futuristic look. Photo by Mark Baker. Though I didn’t know much about Havířov before visiting, it’s one of those places that becomes more interesting the more you learn about it. From the town’s Wikipedia page, I learned it came into existence only after World War II as a purpose-built mining town. 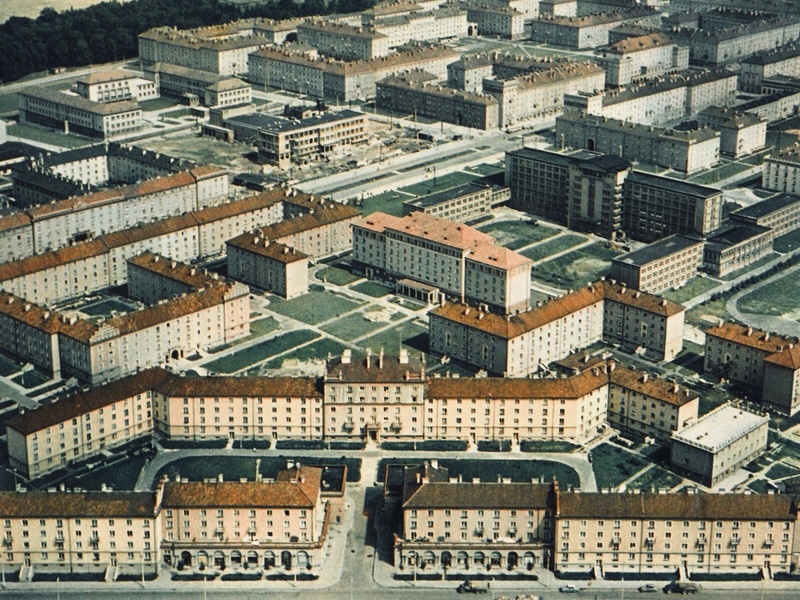 In fact, it’s the youngest “city” in the Czech Republic, having been incorporated only in 1955. The earliest worker housing in Havířov was built in the Socialist-Realism style that I wrote about a couple of weeks ago (after attending an exhibition on Czech post-war housing at Prague’s Museum of Decorative Arts). The city still feels like something of a time capsule from those days. The population is about 70,000 people, but the place feels much quieter. 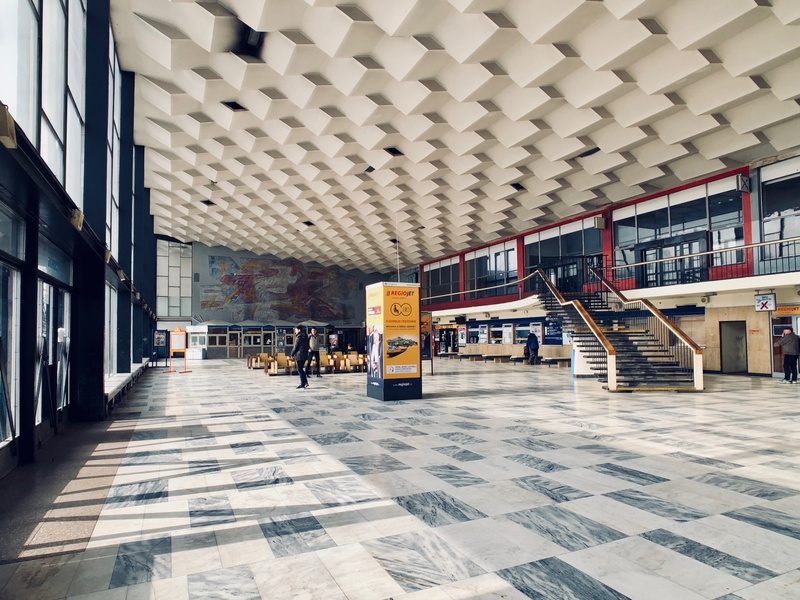 The train station design dates to 1959, shortly after Czechoslovakia’s participation at the Brussels ’58 World’s Fair, and was the work of Moravian architect Josef Hrejsemnou (1928-2010). It was completed over several years in the 1960s. 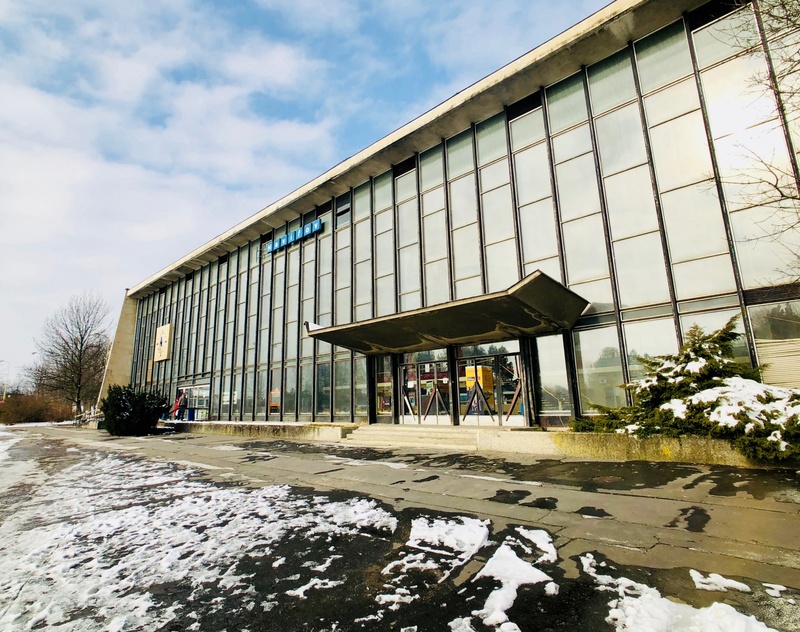 Hrejsemnou was born in the city of Zlín, and may well have developed an appreciation of modern, “Functionalist” architecture after seeing the stylish worker housing that the Czech shoe mogul, Tomáš Baťa, constructed in that city in the 1920s and ‘30s. A wide angle photo of the main lobby as it appears today. The geometric tiles of the ceiling give the space energy. Photo by Mark Baker. The station’s trapezoidal shape, wider at the bottom and narrower at the top, resembles something of a mid-century toaster, or a TV or radio console from the 1950s. Photo by Mark Baker. 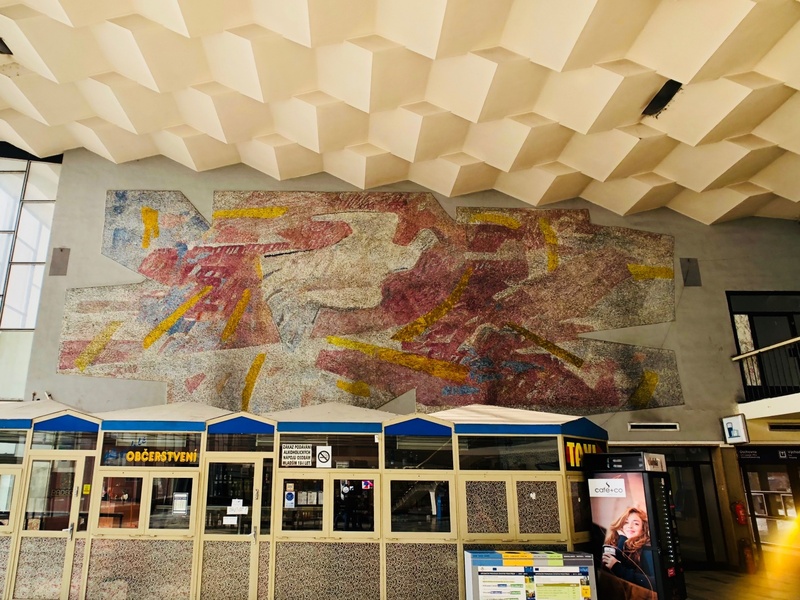 One wall is dominated by a colorful glass mosaic corresponding to a design by Czech artist Vladimír Kopecký, but it's hard to see what's depicted. Photo by Mark Baker. Another view of the station's handsome front exterior. It's less attractive from the back. Photo by Mark Baker. I’ll try to flesh out the definition a bit more here. Brussels’ buildings tended to favor modern materials, like lightweight steel, formica, molded plastic, and glass, but used in ways to add lightness and humor to the structures. The overall aesthetic was minimalism, and in this way reminiscent of interwar Functionalism, but brighter and funkier. Some of the straight-edge rectilinear shapes of earlier buildings from the 1950s were softened and given gentle curves. Brussels’ buildings were often sprinkled with elements here and there of abstract or pop art – such as oversized sculptures of flowers or tiled mosaics. The effect was to lend a playful touch as if to reassure people who used the buildings the future would be fun. The name of the city is etched in playful script on the side of the building. Courtesy photo. Another wide-angle view of the station vestibule. This is the view you first see as you enter the lobby after exiting the train. Photo by Mark Baker. Abstract brutalist statue by sculptor Václav Uruba (1928-1983) dates from 1969 and stood in front of the Havířov station until 2014. It had fallen into disrepair but was saved at the last minute by civic initiative. It now stands at the National Heritage Institute (NPÚ), in Ostrava. Courtesy photo. 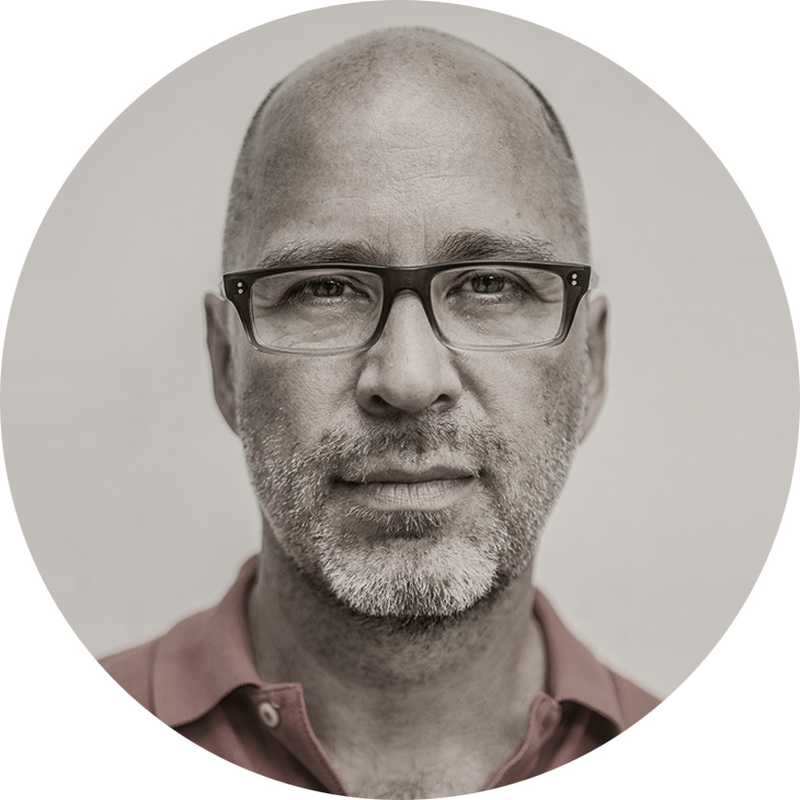 I write a lot about architecture on this blog, but I’m certainly no expert. 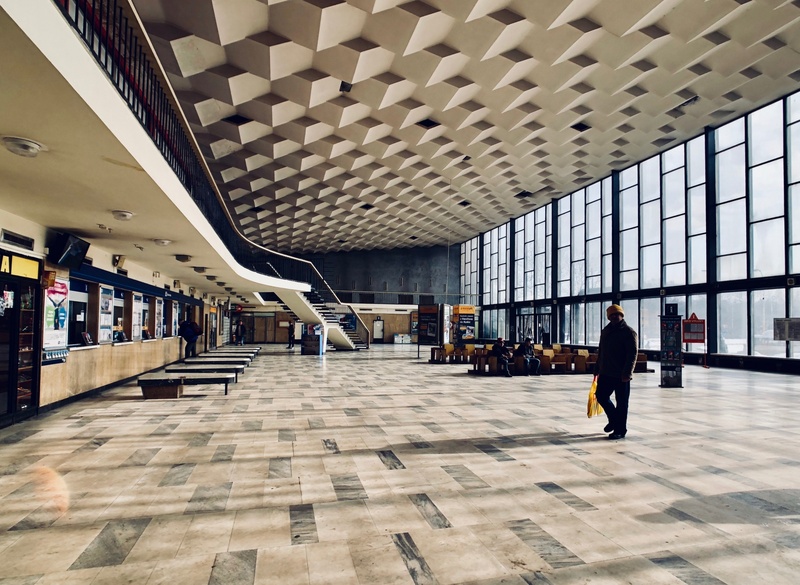 To answer the question of what makes the Havířov station such a textbook example of “Brussels Style,” I’d point out what I think are several key markers. The first would be the building’s overall horizontal, trapezoidal shape, wider at the bottom and narrower at the top. The shape resembles something of a mid-century toaster, or a TV or radio console from the 1950s. 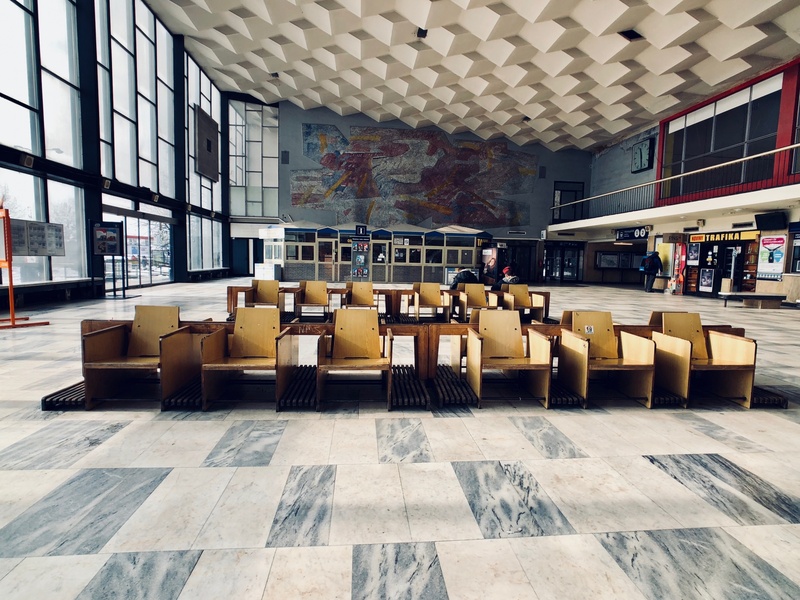 The building’s main architectural statement is clearly the massive lobby, with it full, front-facing glass wall, tiled floors, artfully geometric, tiled ceiling, and gently curving stairway toward the middle. Small rows of wood-molded chairs, curvy, marble benches, and a colorful mural on a side wall provide the finishing touches of a graceful public space that in its heyday must have amused and cheered and elevated the citizens of what, after all, is a fairly remote mining town. 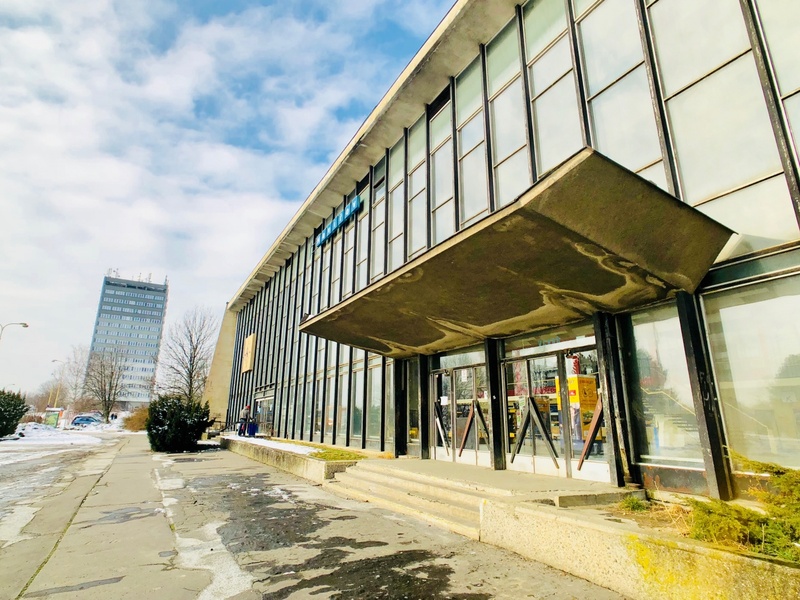 If you're interested in modern architecture, check out my earlier posts on Prague's Kotva department store or the wacky, wonderworld of Communist-era hotels. The interior of this place is stunning! Lovely photos and write-up; so pleased to hear they’re not likely to tear it down after all. Thanks so much for leaving a comment. We’ll see what happens this year, but I’m keeping my eye on the place!